Diamond is an amazing material. I will briefly describe why it is of interest to technology and the scientists. However the bulk of the talk will about the opportunity we have had at the Smithsonian National Museum of Natural History to study a diverse assortment of colorful natural diamonds. This work included the study of rare blue and pink diamonds: the Hope, the Whittelsbach-Graff, Blue Heart and the Aurora Buttlerfly collection of diamonds. The famous Hope and Blue Heart diamonds are national treasures only available to us at night, after the museum is closed. 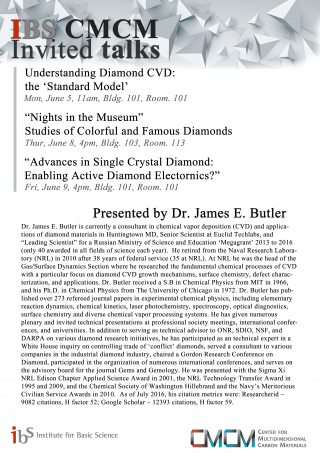 This talk will review studies of these diamonds including phosphorescence, Photo and Cathodo luminescence, FTIR, TOF-SIMS, TEM, and micro Raman.